In the past decade, I've seen more and more overweight children in my pediatric practice. It concerns me because I know that an overweight child's more likely to become an overweight adult, and that in turn can lead to many health problems. My preschooler has a serious weight problem, and now that my 1-year-old is on solids, I'm afraid she'll develop one too. What can I do to help prevent that as she gets older? Ignore the "clean your plate" rule. Kids should stop eating when they're full. The habit of finishing everything no matter what can be quite a difficult one to break down the road. Don't push seconds. If your child's still hungry, she'll ask for more! This will teach her to listen to her body's cues to determine when she's had enough to eat. Train her taste buds. A child who grows up eating wholesome, fresh foods may learn to prefer them for the rest of her life. Our son Matthew never ate junk food as a toddler, and later on, when he was offered cake and candy at birthday parties and school, he didn't overdose on sweets. Avoid eating family style. It's just too tempting to reach for an extra helping of food if it's sitting right in front of you. So fill each plate with an age-appropriate serving -- and leave the rest in the kitchen. Why is it so important for my 4-year-old to drink a lot of water? Send the message that water is what your family drinks. In my opinion, overconsumption of sweetened beverages—those made with corn syrup or sugar—is one of the leading causes of weight gain in children, so limit them to special occasions only. Make it easily accessible. We always put water bottles by our kids' bedsides at night, in their backpacks, around the house, and in the car. Add a little flavor. If your child doesn't like plain water, serve it with a wedge of lemon, lime or orange. Serve water-rich foods, such as watermelon, grapes, soup, and fruit-laden smoothies. Some of these items can be up to 90 percent water. Don't rely on thirst to determine your fluid needs. By the time your child feels parched, his body is already depleted of water. And thirst is often mistaken for hunger, which can lead to overeating. My daughter loves quiet pastimes, such as playing house and coloring. How can I get her moving? Learn a new activity together. Kids are more likely to try something new if Mom or Dad is enjoying it too. For instance, one mother I know took ice-skating lessons with her 6-year-old, and he loved it—especially because he was faster racing around the rink! Don't exercise—play. Have a pillow fight, play tag, or throw a Frisbee. Any activity that causes the body to expend energy is healthy. Suggest a game of Simon Says. My kids always loved this old favorite, and I always made the commands as active as possible. Instead of saying "Touch your nose" or "Pat your tummy," I said, "Jog in place" or "Do ten bunny hops." Other great action-packed games: Mother, May I? ; Duck, Duck, Goose; and Red Light/Green Light. Encourage her to move around while she watches her favorite shows. If the characters on, say, Barney start dancing, get up and copy them. Your child will likely follow suit. After all, why should you get to have all the fun? Our family likes to eat at restaurants a few times a week. 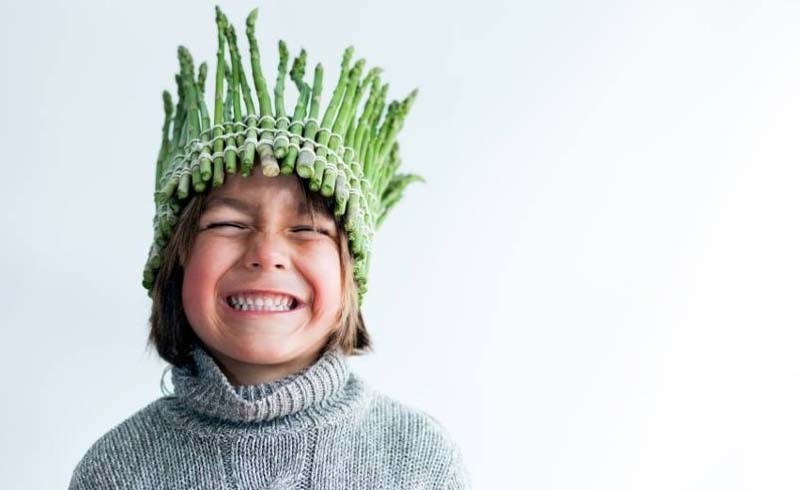 How can I make sure my kids eat healthy when we do? Forget kids' menus. The items are often junkier than what's on adult menus: Hot dogs and fried chicken are the usual fare. I always let my kids order from my menu; we'd split an entree between two of them, choose an appetizer as a main course, or ask for a half-size portion. Start with a salad topped with fresh veggies, which will help fill up your child. Ask for low-fat dressing or oil and vinegar, or use only a tablespoon of regular. Make smart choices. Order grilled or broiled, not fried, lean meats or fish. Tomato-based sauces are better than cream-based, or ask for the sauce on the side and use just a little. Try whole-grain bread with olive oil instead of white bread and butter. Ask for fresh fruit. My 3-year-old just inhales his food. How can we encourage him to slow down and chew? Socialize during mealtime. Ask your child questions about his day. Since you're all sitting down together, it's a great opportunity to catch up—and he'll have to slow down his eating to respond. Martha and I often played 20 Questions with our kids—we'd pick a person, place, or thing, and they'd ask for clues. 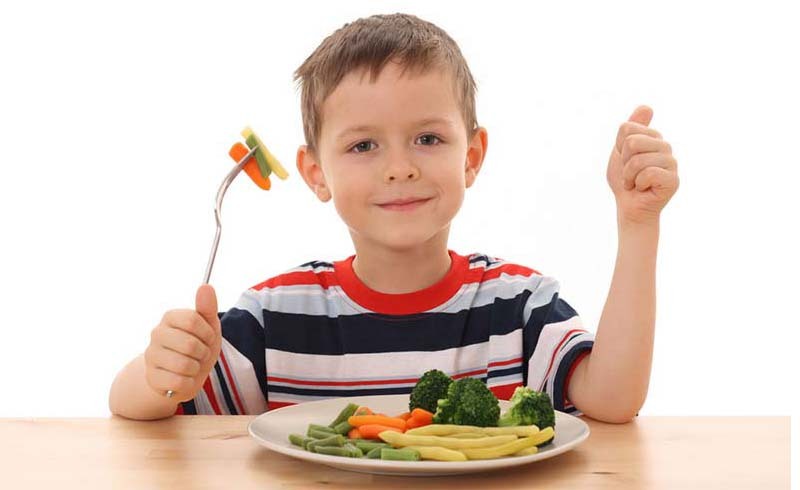 Cut your child's food into little pieces and give him a kid-size fork. That'll help him take smaller bites. Set goals for him. Turn chewing into a game. Ask him if he can chew his steak 20 times, his green beans 10 times. Often, kids get so caught up in the challenge that they don't even realize they're not gulping their meal. Praise proper manners. Some rules of etiquette will automatically encourage slower eating. For instance, have your child put down his fork and wipe his mouth after every few bites. Set a good example. You may be in such a rush to get dinner served, eaten, and cleaned up that you scarf down your own food. Kids learn how to eat from their mom and dad, so make an effort to slow down yourself. Take a moment to enjoy a meal with your family! Our child refuses to try any food that's healthy. How can we motivate her to start eating better? Make healthy food the only option. Clear your refrigerator and cupboards of junk food, and serve only nutritious dishes at mealtime. If your child won't eat what you've made, don't prepare an alternative. Soon, she'll get hungry enough to try what you're offering. Show your child a short list of good-for-you items and ask her to pick three she likes. Then have those foods readily and easily available to her -- kids are more likely to eat things they've chosen. Try one new food a week, prepared in a way you know your child likes. For instance, if her favorite meal is pasta with tomato sauce, use whole-wheat pasta one week. You might be surprised to find that she likes it just as much. Don't give up! Studies show that children sometimes accept a food they originally rejected after they've been exposed to it as many as 10 or 15 times. I know it can be frustrating, but it's well worth the effort.